How familiar is this scene? 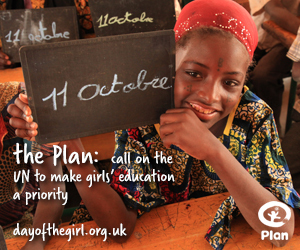 On 11th October, the global children’s charity Plan UK will be launching the inaugural International Day Of The Girl. Following an extensive campaign led by Plan UK, this special day has been designated by the United Nations to highlight the power of investing in the potential of girls throughout the world. According to Plan UK, “Globally, one girl in three is denied a secondary education by the daily realities of poverty, discrimination and violence. Every day, young girls are forced into marriage, isolated from their friends and subjected to abuse. Do you struggle to get everything done in the time you have? Do you find you do more of the things you dislike than the things you enjoy? Do you have little time for quality family fun and me time is something you only dream of? Does work and commitments outside of family life take up the majority of your time? Find Balance In Your Life! Do you struggle to get everything done in the time you have? Do you find you do more of the things you dislike than the things you enjoy? Do you have little time for quality family fun and me time is something you only dream of? Does work and commitments outside of family life take up the majority of your time? Most mums I meet struggle to find enough time to do all the things they need and want to do. It is one of the greatest challenges most mums face, and having to juggle so many different roles and responsibilities leaves them experiencing a range of emotions including frustration, guilt and resentment. The most effective way to ensure your business takes off and continues to grow is to work productively and efficiently, and to focus on your core business goals. No one else will do this for you and you cannot rely on others to have the same passion that will help your business succeed. Remaining focused and committed to achieving your main business objectives will pay off long-term. If your future lacks focus and direction, it will explain much of why you’re currently feeling unfulfilled, unhappy and frustrated. Opportunities are there to be embraced even if you think otherwise and, if you do not control the destination of your own future, you will miss out on many exciting, happy and fun times. Thank you to those mums who took part in my Life Balance survey in July. I recently offered solutions to some of the challenges you are currently facing on my blog in August. I will now cover the answers you gave to the second half of the survey, providing some valuable tips and solutions that will enable you to begin finding your ideal life balance.